SMC 16 Port Fast Ethernet Unmanaged 10/100Mbps Switch. Rack mountable with internal power supply. 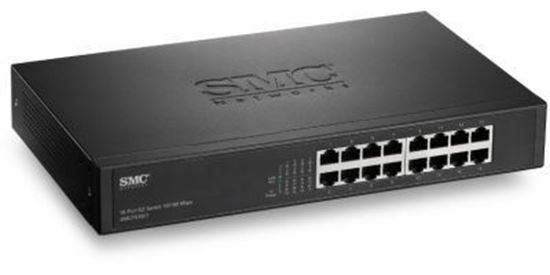 SMC 16x Port Fast Ethernet Unmanaged 10/100Mbps Switch. The EZ Switch 10/100 SMCFS1601 and SMCFS2401 are unmanaged, rack-mountable 16x port Fast Ethernet switches for workgroup and small office environments. All 10BASE-T/100BASE-TX ports deliver dedicated 10/100Mbps links to each attached LAN segment – all with conventional cabling and adapters. Auto-negotiation is used to select the optimal communication mode for each connection, auto-sensing selects the optimal transmission speed. With store-and-forward switching and flow control, maximum data integrity is always maintained, even under heavy loading. Environmentally friendly, the switches consume less power than non-Green Ethernet switches without reducing network performance. Easy installation and reliability make this plug-and-play switches an ideal choice for smooth Fast Ethernet integration in a workgroup and small office network environments. IEEE 802.3az Energy-Efficient Ethernet Support When two 802.3az-compliant switches are connected, up to 49% of power consumption can be saved. Support for Quality of Service When the switches receive a frame tagged with an 802.1p priority tag, it is placed in the appropriate priority queue. Priority queuing is useful in environments where time-sensitive data, such as voice and video, are streamed across the network. Auto MDI/MDI-X on Each Port Support for Auto-MDIX means that no crossover cables are required. Straight-through cables can be used for all connections. Metal Chassis Fan-less Design The compact, rack-mountable metal chassis is ideal for desktop or rack mounting. In addition, the lack of fans provides silent operation.